What are the greenhouse and gardens here for? 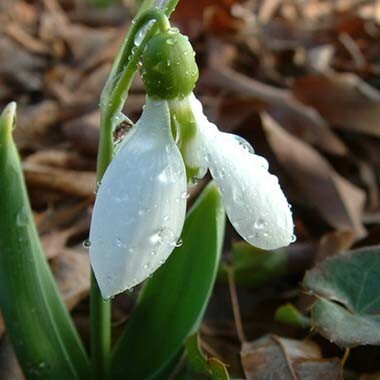 We are here to promote the knowledge and appreciation of plants for educational, environmental, and aesthetic purposes for both the UNC Charlotte campus and greater Charlotte community. The gardens were begun in 1966 by biology faculty Dr. Herbert Hechenbleikner with financial support from members of the Charlotte community to serve as a living classroom for field-based biology courses, and also as a horticultural resource and inspiration for the general public. The Botanical Gardens are a unit of the College of Liberal Arts and Sciences. The outdoor gardens are open and available for visitors during daylight hours. 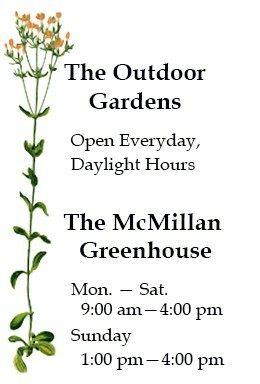 The Greenhouse is open Monday — Saturday, 9:00 am—4:00 pm and Sundays 1:00—4:00 pm. Are the Greenhouse and gardens wheelchair-accessible? Only the Greenhouse is wheelchair-accessible. The 10 acres of outdoor gardens are not wheelchair or limited mobility accessible because they cover varying terrain and slopes with gravel and mulch paths. How do I get to you and where do I park? We are located on the east side of the campus of UNC Charlotte at approximately 9090 Craver Rd. Visitors may park in designated spaces just across the road from the Greenhouse. Click here for directions and parking information. Admission is free, but donations are always appreciated, as your support keeps us growing. There is a donation box located under the visitor sign-in at the Greenhouse entrance. The Greenhouse and 10 acres of outdoor gardens offer the largest diversity of plants in one location in Charlotte. The McMillan Greenhouse contains exotic plants year-round. 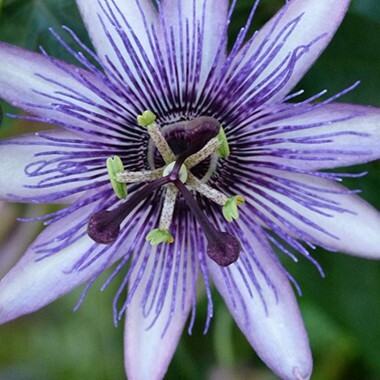 These include orchids, desert plants, carnivorous plants, spice and fruit plants, and a kaleidoscope of tropical ferns, vines, flowers, and shrubs. The Susie Harwood Garden has year-round interest as well, including: camellias, winter-blooming plants, spring bulbs and flowering trees and shrubs, azaleas, water plants, Japanese maples, a mosaic patio, an Asian garden, and the unique Mellichamp Natives Terrace. The Van Landingham Glen is especially lovely in early to mid-spring when wildflowers and rhododendrons are blooming. Additionally, the Glen’s woodland atmosphere and extensive collection of native plants can be appreciated in any season. Do students run the Greenhouse and gardens? No, the Botanical Gardens are run and maintained by professional staff. However, we do hire students to assist the staff. Since there is no degree program for Horticulture or Botany offered at UNC Charlotte, our student workers come from a wide variety of different majors. What they have in common is an interest in working outdoors and learning about plants and gardening. Do you rent the garden for weddings and receptions? The short answer is no, we do not have adequate facilities for large gatherings of people. We occasionally allow very small ceremonies to be held in the outdoor gardens. Read more about this policy here. Absolutely. Just be respectful by remaining on the paths in the outdoor gardens and by not moving plants. If you are a professional photographer, read more about our policy here. Do you have a map to the Botanical Gardens? We do not have one map that covers all three areas of the Botanical Gardens, but there are seasonal brochures at the entrances to both outdoor gardens that contain a trail map of the respective garden. The woodland garden looks big. Can I get lost out there? The Van Landingham Glen may look big, but it is only 7 acres, so you cannot get lost. If you feel turned-around, head for the edges and follow the paths to an exit. You may also follow the creek downstream to the cabin and exit out the side entrance just up the hill. Guided tours can often be arranged (in advance) for adult and school groups of relatively small size. Read more about our Guided Tours here. Are your plants for sale? Plants from our permanent collections are not for sale. However, we do hold three plant sales a year. Additionally, we often have a small selection of plants for sale throughout the year. Our plant sales are the week of Valentine’s Day (orchids and houseplants), the third Friday and Saturday in April (our biggest sale), and a fall sale in October (hardy trees, shrubs, perennials) . Do you have restrooms, water fountains, and benches in the gardens? There are no restrooms or water fountains in the outdoor gardens. There are wooden benches and a few stone benches scattered throughout both outdoor gardens. Restrooms and a water fountain are located in the greenhouse building. Yes, if they are on leashes.If you bring your dog to the gardens, please remember to always dispose of your pet’s waste properly. You can read about UNC Charlotte’s policy here. Do you have an ATM, vending machine, or gift shop? We do not have a gift shop, vending machines, or an ATM. However, there are vending machines in adjacent buildings and ATMs outside of the campus bookstore, located just a short walk from the greenhouse. Is there somewhere on campus to eat? We benefit from being located on a large campus. During the week (when classes are in session) there are several cafeterias, fast food-type restaurants, and two coffee shops open on campus. On the weekends, however, these are closed. There are many places to eat in the surrounding area on Harris Blvd., University City Blvd., Tryon St, and Mallard Creek Church Rd. She is! Currently, Bella is in leaf-form, after resting as an underground tuber for nearly a year. “Bella” is the nickname we gave the Titan Arum plant that bloomed here in July of 2007. Read more about our Titan Arum here. Why don’t all your plants have labels? It is our goal to have the majority of our plants labeled in the greenhouse, and to have labels on a significant portion of the plants in the outdoor gardens. Plants go out with labels, but they often disappear (intentionally or unintentionally). It is a daunting task to continually replace them. Please do not hesitate to ask a staff person about the identity of a plant without a label! We will do our best to ID it for you. How many people do you have working to maintain the gardens? The 10 acres of outdoor gardens have two permanent (30hr/wk each) gardeners. They are assisted by temporary, student and volunteer help that, together, is equivalent to an additional 10-25 hours a week per garden The greenhouse is maintained by two permanent horticulturists (30hr/wk each) and between 5-10 hours per week of student help. Where did you get all these plants? We get plants from a variety of sources. Some come from other botanical gardens, from commercial greenhouses and nurseries, and from cuttings and starts from other plant professionals. Of course, it has taken many years to amass the collections we maintain today. That depends on what you are hoping to see and experience. There truly is year-round interest in the greenhouse and Harwood Garden. To see a listing of yearly highlights, click here. Can I take classes here? The Botanical Gardens offers several classes and a certificate program throughout the year aimed at a general gardening audience. As far as university (for academic credit) courses go, there are generally three plant-related courses taught (through the Biology Department) every year. There is no degree program in Horticulture at UNC Charlotte. 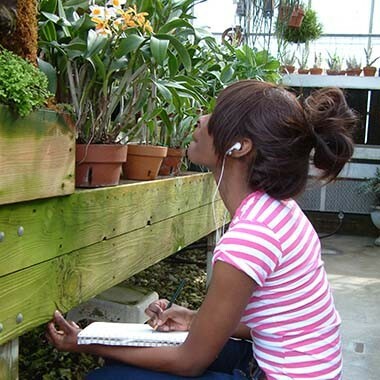 Central Piedmont Community College (Cato campus) offers a two-year degree in Horticulture and would be the closest resource for horticulture courses. We do. Read more about volunteering opportunities here.